Navy Heavyweight Check Fringed Table Runner 14" X 108"
Navy Heavyweight Check Fringed Table Runner 14" X 72"
Navy Heavyweight Check Fringed Napkin Set of 6 Solid Navy Heavyweight Fringed Table Runner 14" X 108"
Solid Navy Heavyweight Fringed Napkin Set of 6 Bbq Fun Print Outdoor Table cloth 60" X 120"
Bbq Fun Print Outdoor Table cloth 60" X 84"
Bbq Fun Print Outdoor Table cloth with Zipper 60" X 84"
Bbq Fun Print Outdoor Table cloth with Zipper 60" X 120"
Our table runners provide a great place to set down platters to prevent spills and scratches on your tabletop. These can be used on more than just the dining room table, place on entryway, foyer, console or coffee table. Our table runners provide a great place to set down platters to prevent spills and scratches on your tabletop. These can be used on more than just the dining room table, place on entryway, foyer, console or coffee table. Design Imports spill proof table cloths are perfect for outdoor use. The polyester material makes for simple cleanup. Great for Bbq's, summer gatherings and more. Wine Heavyweight Check Fringed Table Runner 14" X 108"
Finish off your tabletop with matching napkins, made oversized to handle any meal no matter how messy. We make it simple to coordinate the perfect table setting, mix and match with our placemats and table runners to complete the look for your setting. Our table runners provide a great place to set down platters to prevent spills and scratches on your tabletop. These can be used on more than just the dining room table, place on entryway, foyer, console or coffee table. Have your dishes pop by using placemats as the backdrop, these generous sized 13" x 19" mats are made of 100% cotton with a 1" hem and decorative fringe for a casual, everyday look. Set a place for everyone, these placemats are sold as a set of 6. Design Imports spill proof napkins are perfect for outdoor use. The polyester material makes for simple cleanup. Great for Bbq's, summer gatherings and more. Set of 6, measure 20" x 20". Brighten your tabletop with braided round placemats. Framing plates with color and texture as they catch drips and crumbs saving your tablecloth from stains. With a round shape that looks great under both classic and contemporary place settings. Asset Camper Embellished Placemat Set of 4 Rv Park Jacquard Table Runner 14" X 72"
Design Imports' placemats are a staple for every kitchen table, breakfast nook, and dinner table. Made of 100% cotton, these placemats have been a favorite for years. Each placemat measures 13" x 19" and will fit most tables. 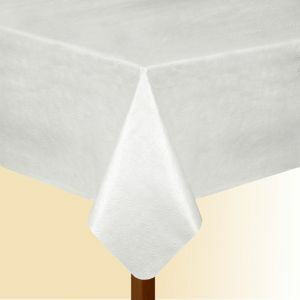 Our table runners provide a great place to set down platters to prevent spills and scratches on your tabletop. These can be used on more than just the dining room table, place on entryway, foyer, console or coffee table. Rose Seersucker Table cloth 60" X 104"
Rose Seersucker Table cloth 60" X 84"
Rose Seersucker Table Runner 14" X 108"
Rose Seersucker Table cloth 70" Round Wine and Sunshine Table Runner 14" X 72" Coral Cabana Stripe Outdoor Table cloth 60" X 120"
Coral Cabana Stripe Outdoor Table cloth 60" X 84"
The traditional cotton seersucker is the perfect colorful addition to freshen your home! The set of 6 has that classic, textured pinstripe that reminds us of warm-weather parties. These napkins measure 20" x 20". Design Imports 100% cotton table runners come in a variety of colors and sizes. These table runners are perfect for parties, showers, dinners, everyday use and more. All of Design Imports cotton table runners have a 1" folded hem and mitered corners. Design Imports zippered umbrella table cloths are perfect for outdoor use. These wonderful outdoor table cloths zip on and off easily around patio table umbrella The polyester material makes for simple cleanup. Great for Bbq's, summer gatherings and more. Tidal Stripe Fringed Table Runner 13" X 72"
Tidal Stripe Fringed Placemat Set of 6 Summer Stripe Outdoor Table Runner 14" X 108"
Summer Stripe Outdoor Table Runner with Zipper 14" X 108"
Summer Stripe Outdoor Napkin Set of 6 Baja Stripe Fringed Table Runner 13" X 72"
Our table runners provide a great place to set down platters to prevent spills and scratches on your tabletop. These can be used on more than just the dining room table, place on entryway, foyer, console or coffee table. Design Imports 100% polyester table runners are perfect for indoor or outdoor use. The waterproof and stain resistant polyester material makes for simple cleanup. Great for Bbq's, parties, summer gatherings, dinner with the family. Our table runners provide a great place to set down platters to prevent spills and scratches on your tabletop. These can be used on more than just the dining room table, place on entryway, foyer, console or coffee table. Pastel florals bloom on a gently textured ground, giving Erlene's Julia Blush Table Linens Collection a fresh and romantic appeal. Tablecloths include a stain and water repellent finish; combine them with matching napkins and placemats to add a coordinated look to your table Spice up your tablescape during dinners and parties with the warm red and orange-striped tones of the Elrene Barrington 90" woven cotton runner. Add elegance to your dining area with a collection of cut-to-fit vinyl table pads in round, square and rectangular shapes, featuring an embossed floral pattern. Designed to protect against spills and scratches, use it on its own or under a tablecloth for a finished look. The Barcelona Damask table linens collection features a regal damask design in eight different rich, solid colors. 100% Polyester. Machine wash and dry. Made in China. The Barcelona Damask table linens collection features a regal damask design in eight different rich, solid colors. 100% Polyester. Machine wash and dry. Made in China. The Barcelona Damask table linens collection features a regal damask design in eight different rich, solid colors. 100% Polyester. Machine wash and dry. Made in China. Solid colored striped microfiber table linens. Available in 5 colors. Easy Care. Dual Action Finish: Stain/Water Resistant. 100% Polyester The Barcelona Damask table linens collection features a regal damask design in eight different rich, solid colors. 100% Polyester. Machine wash and dry. Made in China. The Barcelona Damask table linens collection features a regal damask design in eight different rich, solid colors. 100% Polyester. Machine wash and dry. Made in China. The Elegance Plaid table linens collection features a solid plaid pattern and is available in seven colors: Beige, Black, Blue Shadow, Holly Green, Poinsettia Red, Ribbon Gold and White. 100% Polyester. Machine wash and dry. Made in China. The Elegance Plaid table linens collection features a solid plaid pattern and is available in seven colors: Beige, Black, Blue Shadow, Holly Green, Poinsettia Red, Ribbon Gold and White. 100% Polyester. Machine wash and dry. Made in China. The Elegance Plaid table linens collection features a solid plaid pattern and is available in seven colors: Beige, Black, Blue Shadow, Holly Green, Poinsettia Red, Ribbon Gold and White. 100% Polyester. Machine wash and dry. Made in China. The Santa Clara 16-piece solid-colored table linens set is perfect for your summer entertaining needs. A mixture of 4 fiesta inspired colors of red, yellow, green and turquoise, it is sure to liven up your table landscape. The set includes 8 solid-colored ribbed placemats and 8 solid-colored napkins. There are 2 placemats and 2 napkins for each of the four colors. The Pennington table linens collection features a transitional solid textured pattern and is available in three colors: Gold, Green and Ivory. These table linens are both stain and water resistant. 100% Polyester. Machine wash and dry. The Pennington table linens collection features a transitional solid textured pattern and is available in three colors: Gold, Green and Ivory. These table linens are both stain and water resistant. 100% Polyester. Machine wash and dry. The Color Stream collection features a brushstroke stripe pattern and is available in both a cool or warm color palette. Tablecloths and napkins are treated with a dual action finish that makes this collection easy care and suitable for the outdoors as well as indoor. All items are made from 100% Polyester and can be machine washed and dried. The Evelyn collection features a vibrant, floral watercolor design that is sure to enliven your décor. Tablecloths and napkins are treated with a dual action finish that makes this collection easy care and suitable for the outdoors as well as indoor. All items are made from 100% Polyester and can be machine washed and dried. The Kona Tropics collection offers a warm island vibe with a scene of rich watercolor tropical flowers and tonal green palm leaves. Tablecloths and napkins are treated with a dual action finish that makes this collection easy care and suitable for the outdoors as well as indoor. All items are made from 100% Polyester and can be machine washed and dried. The Coastal Settings collection offers a serene allover pattern of coral and seashells. Tablecloths and napkins are treated with a dual action finish that makes this collection easy care and suitable for the outdoors as well as indoor. All items are made from 100% Polyester and can be machine washed and dried. The Sydney collection offers a tonal geometric pattern in three vibrant colorways: Blue, Lime or Turquoise. Tablecloths and napkins are treated with a dual action finish that makes this collection easy care and suitable for the outdoors as well as indoor. All items are made from 100% Polyester and can be machine washed and dried. A traditional embroidery-inspired design enlivens the Elrene Circle Stich Table Linens collection. Stain, fade and spill-resistant polyester makes these linens a go-to for relaxing and stylish indoor or outdoor living and lively colors add festive sophistication to your tablescape.